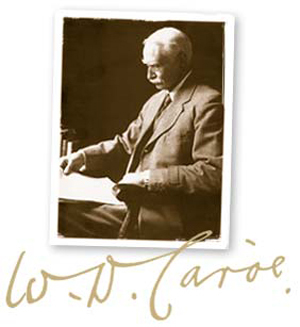 Caroe & Partners was founded in 1884 by W.D.Caröe. Caröe (1857-1938) was a major figure in the Arts and Crafts Movement; he was architect to the Ecclesiastical Commissioners from 1895 until his death and was architect to numerous ecclesiastical buildings including St Davids and Durham Cathedrals, and Tewkesbury and Romsey Abbeys. Caröe was not only an architect of striking originality and pioneer of building conservation, but also a distinguished designer of furniture, embroidery, metalwork and sculpture. The rich legacy of the work of W.D. Caröe has never been of greater relevance. The revival of interest in architecture of the Edwardian period and of the 1920s and 1930s has provoked a re-evaluation of the work of those architects, like Caröe, who stood apart from the International Modern Movement to produce 'traditional' architecture.